You can clisk on all these photos to see them full size. 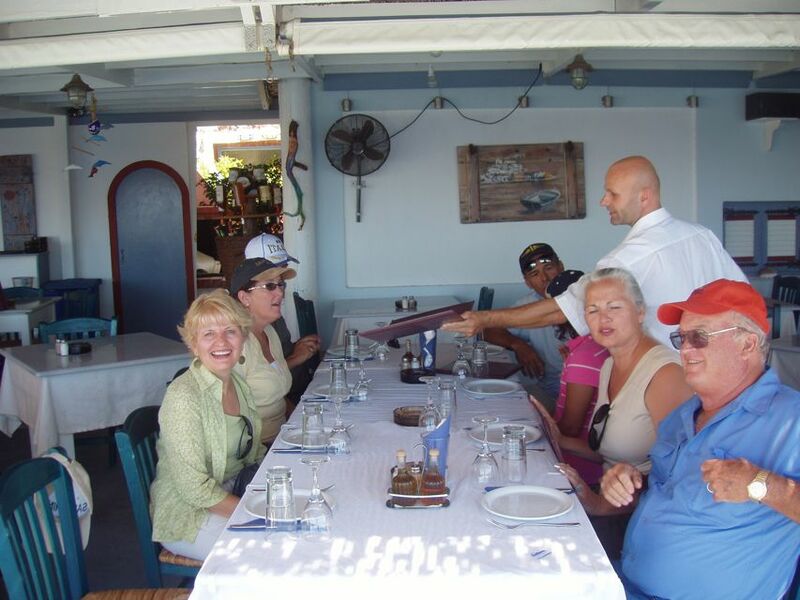 Just a short note to thank you for our great tour of Santorini on September 9. I have been in touch with the Buchanans in Atlanta and they enjoyed their tour as well. Patricia, we enjoyed meeting you and seeing your previous home that you have for rent. the lunch was delicious as well. 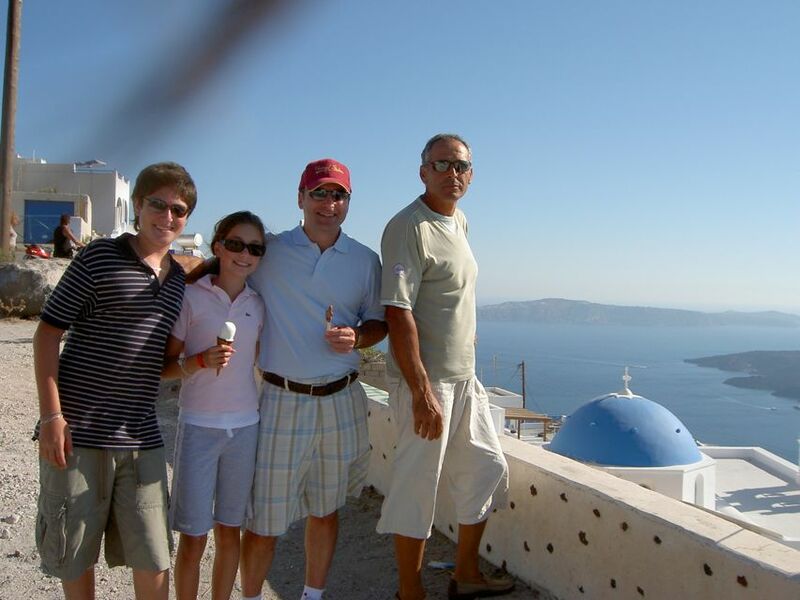 Also Barry took some terrific photos of Santorini and the ones you took of all of us came out great as well. Santorini is beautiful and I can understand why you love living there. We shall recommend your services to anyone that we know who is traveling to Santorini. We just want to thank you for the excelent tour of the island that you gave us last week. 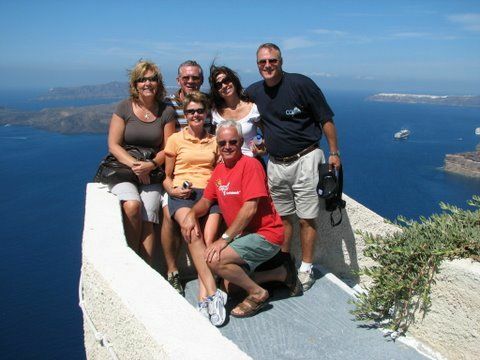 We will be sure and recomend your company to any friends who may be planning a trip to Santorini. Thank you very much for your bus service and for Sophia, she was adorable (all the men really loved her!). 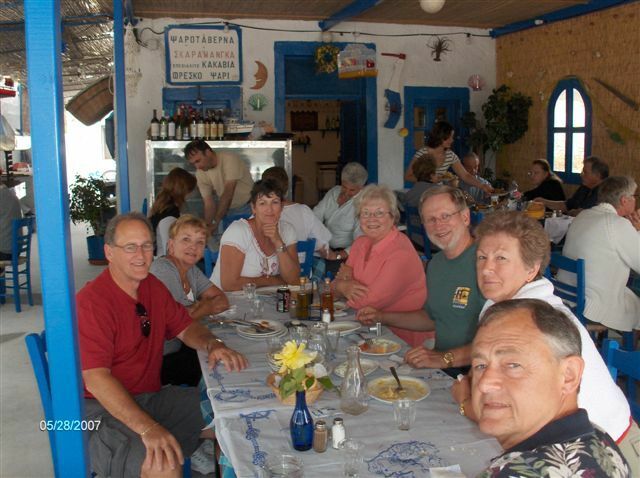 Everyone had a wonderful time in Santorini and lunch was wonderful! We all loved the winery and smuggled our wine onboard the ship (they usually take all alcohol and 'hold' onto it until the last night) and had it poolside with pasta and pizza that night! When I get caught up, I will write a review for the other 400 Cruises Inc agents and the 400 Cruise One agents so hopefully you will get a lot more business. I look forward to doing more business with you in the near future! 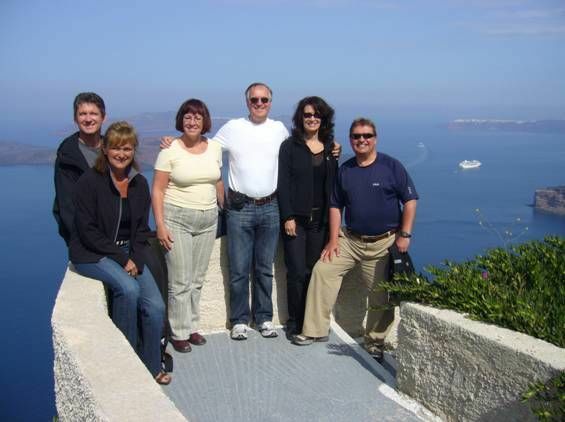 We wanted to thank you so much for our wonderful tour of Santorini. We all had such a terrific time and you taught us so much about the island. We also enjoyed our lunch at the beach so much -- it was the best lunch that we had at any of islands. Our photos were terrific and truly showed your beautiful island, and we now have such great memories. Please feel free to use us as a reference for your great tours! I had a text form my clients Bowaters & Wingfields - they said you did a fantastic job and they really enjoyed the tour of the island they did with you immensely. Thank you so much!! I will remember you for any other clients I have who need some-one to show them Santorini. Do you know of anyone on Corfu who could do the same sort of thing as the cruise line have cancelled their tour there and they have asked if I know of anyone who can take them on a tour. 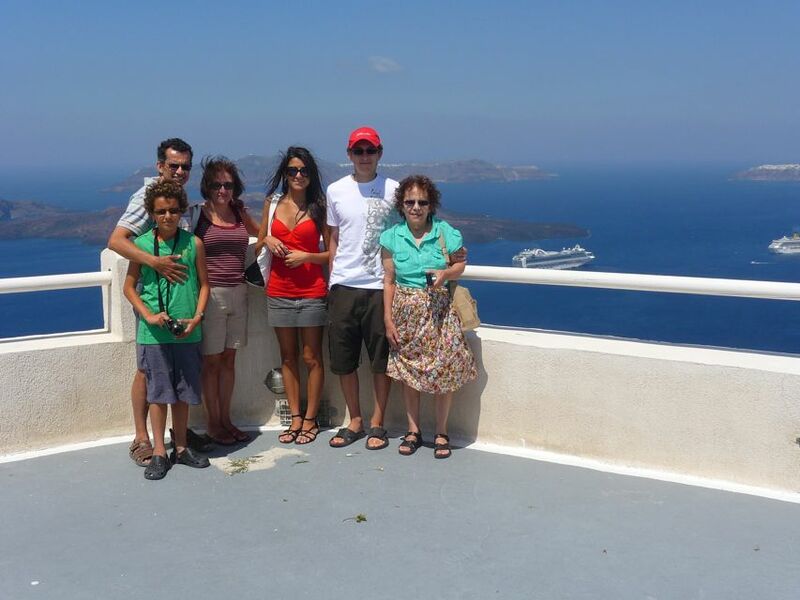 We all agree that we had the best time with you last week in Santorini than any where else on our cruise! I've attached a few photos for you..... We enjoyed a relaxed, comfortable day seeing the sights with you and loved our lunch away from the crowds in the taverna. Your vacation rental homes look wonderful, and if we are lucky enough to visit your island again some day, we will contact you! Let me know if you ever decide to come to the US and if you would like to consider trading houses. I can tell you about the area and also send photos of the house. 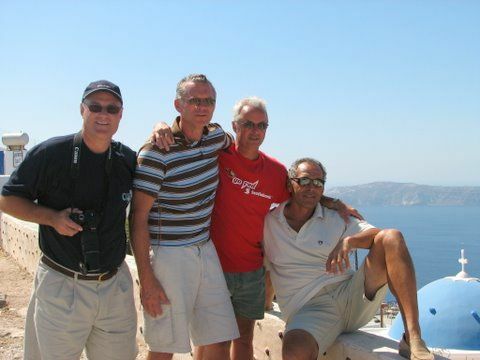 I enjoyed a wonderful day touring Santorini with you in May, with 3 other friends (see photo). 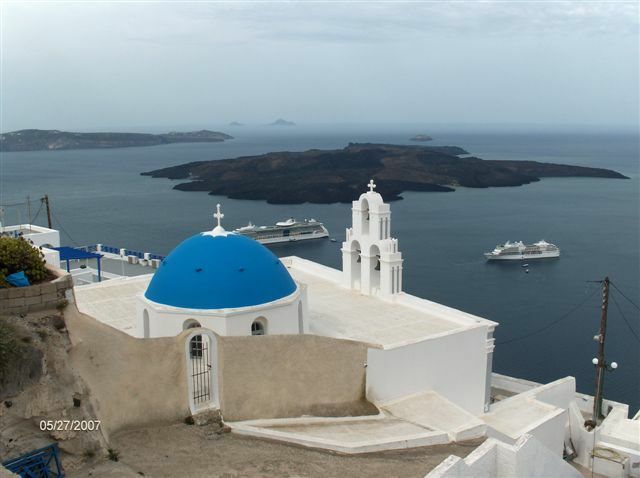 I have 4 good friends who are going to be on a Holland America cruise that will stop in Santorini within the next couple of weeks. If possible, they would love to meet you and spend time touring the island. One of them, Janet Brumfield, will contact you with specific dates and times. One of the friends has had recent knee surgery, so the group won't be able to spend as much time walking as we did, especially in Ia. But there is so much to see, I'm sure that they would enjoy a driving tour. I will give them your contact information so they can make arrangements. 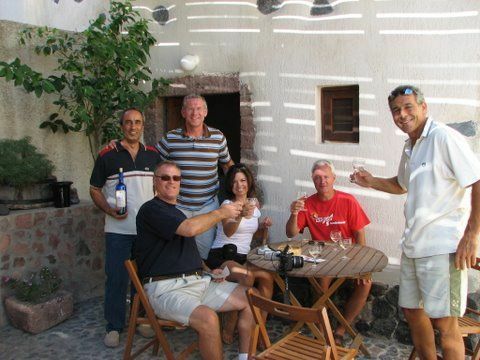 We are still hoping to come back to Santorini and rent one of your villas....perhaps in 2010! My family and I are finally getting back to our normal everyday schedules. I want to thank you for a wonderful tour of my very favorite port on our cruise in September, 2009. You made our tour very informative and enjoyable. When we return someday I will make sure I contact you again. I just wanted to thank you for the tour you provided for Brad and Angelica Moore on September 11th. They were very pleased with all you did for them, as am I.
I am grateful you were available and willing to work with me to arrange a special tour for their honeymoon. I would be happy to be used as a reference any time I could be useful to you. We would like to thank you for the beautiful tour that you took us in Santorini and the pleasant atmosphere you had created in your tour bus. Professionalisum and politness is very important and you had both. Thank you for your patience when we were late comming back from our walks. We give you a 5 star service standards and will definitely recommend you to freinds and family if the visit Santorini... Our hellos to your daughter. Just got home and found your e-mail. First, THANK YOU for a very special day. We all agreed it was the best day of our entire trip. It was very nice meeting your entire family. Second, thank you for the credit which I had overlooked. You are a very honest man. time for another wonderful vacation. Again, thank you for a wonderful time. 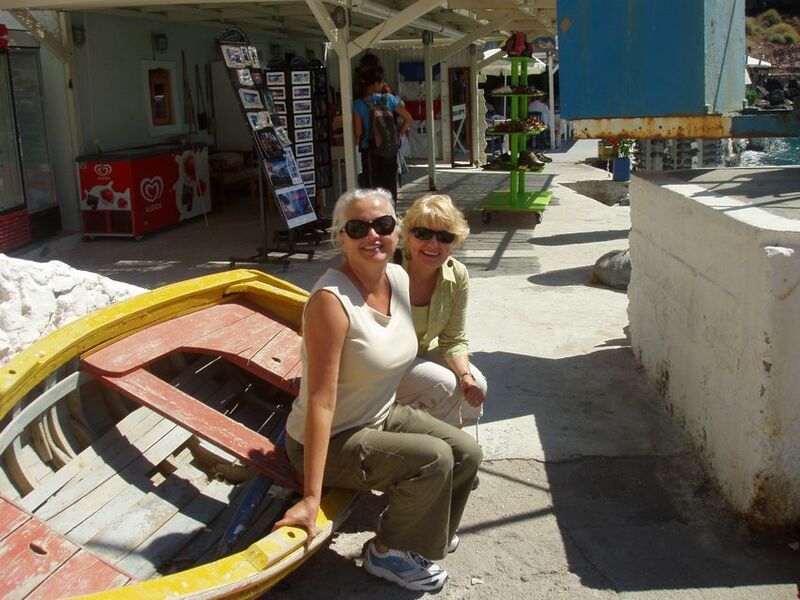 Thanks for a great tour of Santorini June 4th with Gabrielle. He was delightful. He gave us lots of information about economics, religion, history, viniculture and general fun stuff. I would recommend him to anyone! We certainly saw a lot of the island and his van was clean and comfortable. Give him our thanks! I just wanted to thank you for providing us with such a fantastic day in Santorini on May 15th ( I think.) Gabrielle was our driver and he was fantastic.We all really enjoyed his infornative trip and his enthusiasm. He showed us far more of Santorini than what we had hoped to see so we were very pleased. So much so that we want to return for a longer stay.Next time we plan to stay for maybe 3 nights if we can find somewhere at a reasonable cost to stay. We are looking at about a year away, would you have any suggestions where 4 adukts could maybe get an apartment? Either in Oia or Thira? Cheap is good for us, a view would be great but as I am a travel agent myself, I am also well aware that cheap and views dont normally go in the same sentence. Any ideas that you could share. We are flexible on dates but are looking at April 2008. 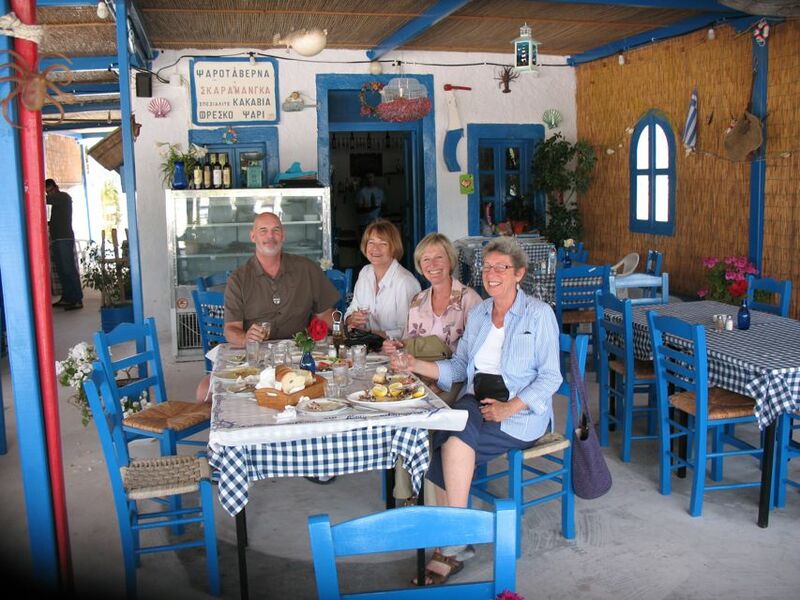 JUST WANTED TO LET YOU KNOW HOW PLEASED WE WERE WITH OUR DAY IN SANTORINI THAT WE SPENT WITH EMMANUELLE. IT WAS THE MOST WONDERFUL AND BEAUTIFUL DAYS OF OUR TRIP. HE WAS ABLE TO SHOW US SO MUCH THAT WE WOULD HAVE MISSED OTHERWISE AND HIS VAST KNOWLEDGE OF THE ISLAND WAS AWESOME AND VERY INTERESTING. WE COMPLETELY ENJOYED OURSELVES AND WOULD RECOMMEND YOUR SERVICE TO ANYONE TRAVELLING TO GREECE. THANK YOU SO MUCH FOR SUCH A WONDERFUL EXPERIENCE. OUR REGARDS TO EMAUELLE. I wanted to thank you for the tour of Santorini a few weeks ago. You were great. Our cruise, if you remember, went to Albania after leaving Santorini. You were surprised. Albania has no tours or help for tourists. You should think about starting a tour business there. Good luck. Please sent our good wishes to Patricia, Lydia, and Athena. Thank you so much for sending my glasses to Venice . Santorini was one of our favourite stops and you made it very memorable for us. We will certainly recommend your company to others. Good luck with your new house and we hope to see you in Victoria one day and we can be your guide. 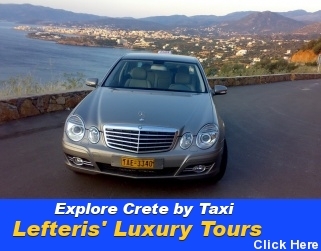 dimitris, thank you again for the lovely day tour. 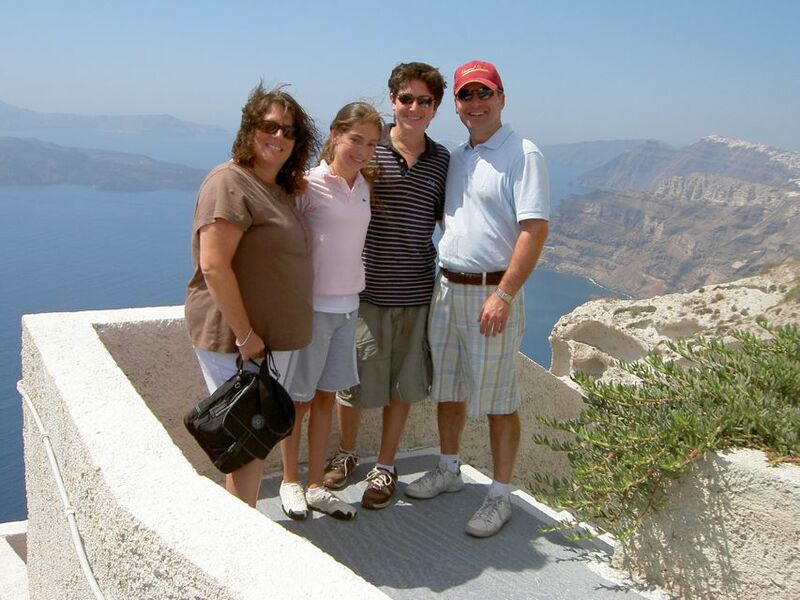 we had such a wonderful time in greece and especially in santorini. we will certainly share your information with anyone heading that way. thanks again. We enjoyed our Santorini tour. Thank you for accommodating the larger group so quickly. I also greatly appreciate you and your driver taking very good care of my parents. When you drove up closer and it was really not allowed, I knew you were very kind and helpful. We enjoyed all the beautiful photo stops. I would definitely recommend your company. If I knew more about the island ahead of time I would have skipped the winery and spent more time in Oia and the beach. It is just a personal preference as I'm sure many enjoy the winery. We also appreciate you sharing your knowledge of the area while we were driving. Most of our other tours did this also. We did have one in Naples that was too quiet and I feel it made the tour less enjoyable. Your love of the island is apparent and we loved hearing you tell us the history. Just a not to thank you for your excellent service during our recent visit to Santorini. Your guide, Mamen was terrific. We found her knowledge and ifnormation to be thorough. We also can�t thank her enough for her lunch recommendation and getting our grandchildren to a terrific and uncrowded beach, opposite the restaurant. We would not hesitate to use your services again should we return to Santorini and to recommend your company to any who asks. 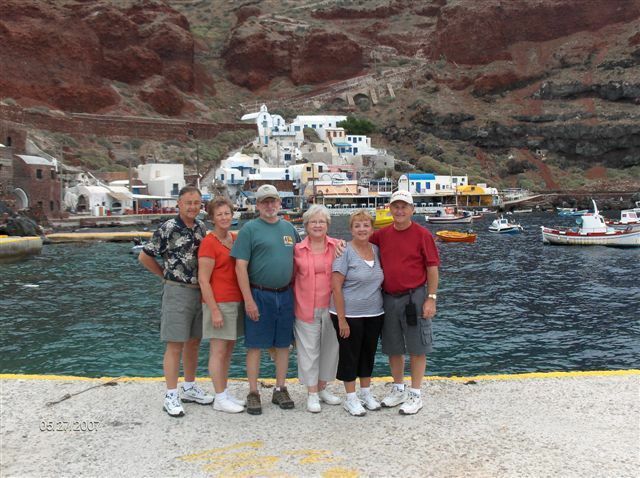 I went on a tour with 2 other couples in Santorini with your wife during June 5-17 we were on the Oceania cruise line. You will have to tell your wife that I'm the one that called the Octopus Tentacles " Testicles " when they passed the plate around for everyone to try. We were at a restaurant on the water, one that she chose to eat at and she ordered everything for us to try. I have never had squid before and had no idea that the little legs were called Tentacles. I hope she remembers this. The funny thing about it is the people we were with that we joined in on with the tour, the man was a retired minister. He really got a kick of what I said. They wanted me to try them and I said ok a few minutes later and said to pass the Testicles. Then I felt just a little embarrassed. I will never forget this day that is for sure. Memories, that is what it is all about. Just wanted to let your wife know that it was a great tour and I will recommend you to everyone I know. Really enjoyed it. Take care. Please tell your wife hello for me. Hope to see you again some day. 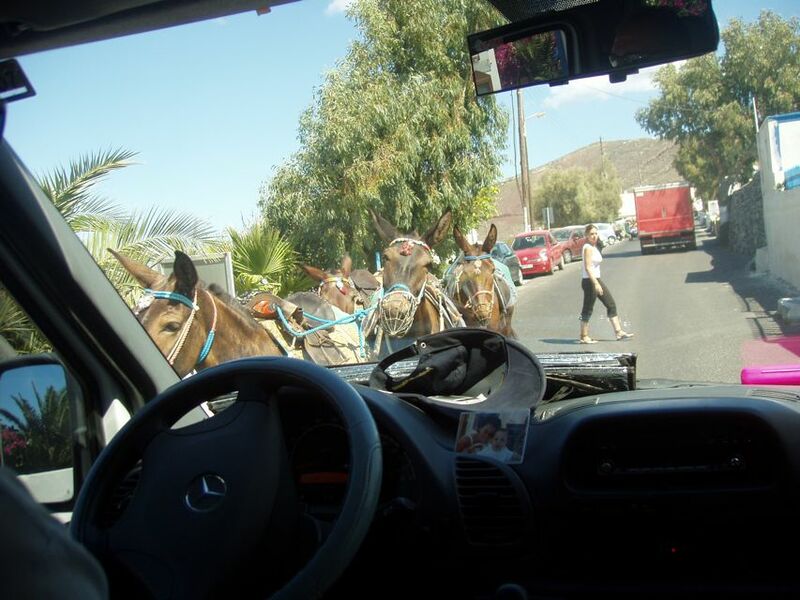 I wish to take this time to Thank You for the driver/guide we had for our tour of Santorini. He was absoulely the greatest, he showed us so much of the island and the experince was fantastic, Gabriel was informative and tailored the trip to what we wanted. 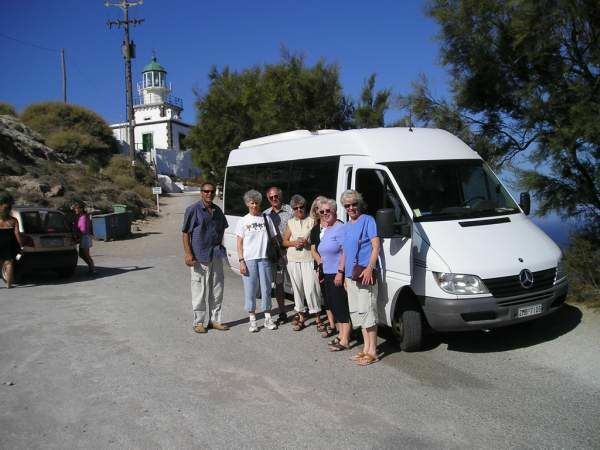 We were very impressed with the tour and what there was to see on your island, once again from the 4 of us, a great big Thank You for making this trip so unforgetable.We will be sure to recommend you to anyone who will be making a visit to Santorini in the future. Please forgive us for the delay in getting this message to you. Where the time has gone, well we just don't know, but it sure did take us a good two weeks to adjust to the jet-lag, time-change, etc. after returning home from the final leg of our trip, from Dubai on October 13th. We and our friends (all 6 of them) cannot thank you enough for the wonderful tour of Santorini that we experienced with your expert and professional guidance. 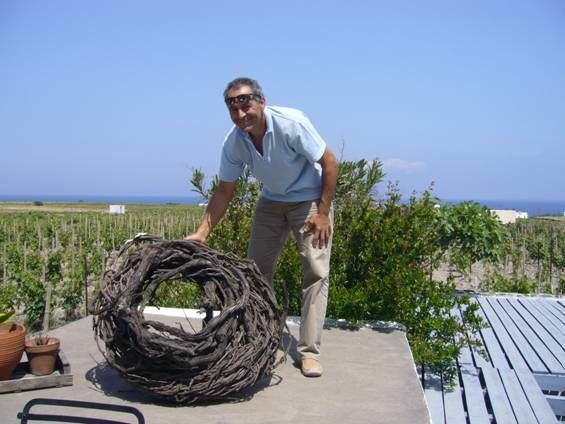 Also the tour of your friend's winery, was special indeed; also not to forget the time you took to get our friend Dwight the tomato seeds and explaining to him and our other friends, interested in growing grapes, how this is done in Santorini. And then of course, there is that lovely local fish restaurant you took us for lunch. That was really special. And I have a story to tell you about that. One of the TV Cooking Shows we see in north America, is hosted by Giada De Laurentis, the granddaughter of film producer Gino De Laurentis. One of her Cookbooks is called 'Everyday Italian'. On one of her websites she comments on her favorite restaurants around the world. Sure enough she mentions Santorini and the Dolphins Fish Taverna (Restaurant). 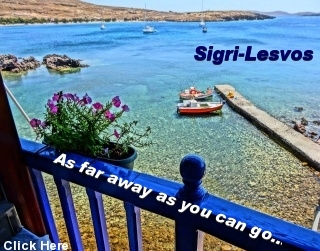 We all enjoyed Greece tremendously, and maybe one day we will have the pleasure of returning to your island paradise. Wanted to again thank you for the arrangements for our guide, Nick. Trudy and I enjoyed being with him and the other couple as well. They were very pleasant. Nick is a very funny and interesting and informative individual for the tour. His history of Greece is excellent. Thank you. I will keep your email handy for friends who may be planning a trip to your beautiful island. Well we are home again. We had a GREAT TIME. Santorini was a highlight for everyone. The girls that went out for dinner could not stop talking about what a wonderful time they had and were overwhelmed by your not taking any money from them for your added service. Just wanted you to know how much we all appreciated our day and hope to send more people your way in the future. I will email you a picture when I get them back. We want to send our thanks for our wonderful day with you on your beautiful island. Santorini and our tour with you was truly the best day of our cruise, thanks to your good humor, good information and so much fun. We were very happy to meet Jenny, Rob, Jan and Lewis, and we hope to see them again. We did tour the Cote d'Azur with them. Our lunch at Remezzo was delicious, and I'm so glad to have the glass pitcher for a souvenir. If any of our friends plan a trip to Santorini we will surely give them your name and tell them you are the best! Hank and I wish you and your family much happiness with your new baby. It would be a pleasure to meet again some day. Just a quick note to thank you for the very enjoyable tour you took us on last September. It was one of the highlights of our stay on Santorini. Your knowledge of the island and great English were a real treat. Everything was first class! We wanted to thank you for our day on Santorini. We started out under a cloud when we missed two of our group, but you pulled us through and made the day wonderful when you found them and we were able to truly enjoy the pleasures of your Island. You provided not only a good history, but showed us the charm of the people and the area. We loved the lunch and your menu of local favorites. The touring was very comfortable in your new vehicle, and your interplay was totally enjoyed. Again our thanks for a brief glimpse into your life. Maeve, Peter and I want to thank you for looking after us so well while we were in Santorini. We enjoyed having you take us around and we truly enjoyed your kindness. We want to know how the picture came out with the bus. Are we on your website yet??? We will be back next year on Monday Sep.20 - Thurs. Sep.23, 2004 so we would appreciate it if you once again will look after our group. I will contact you in the new year to discuss further. Until then please accept our thanks and will look forward to seeing you next September 2004. Have a restful winter and enjoy yourself. 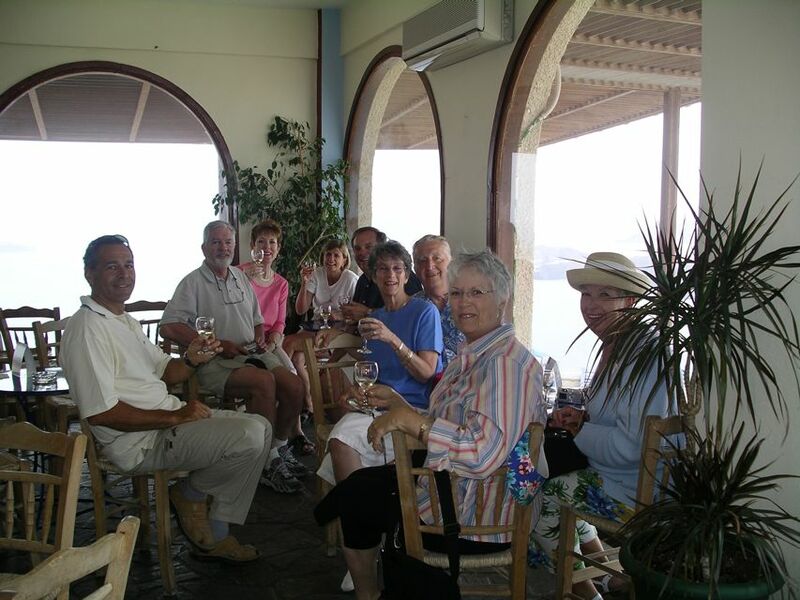 Our group thoroughly enjoyed our tour of Santorini with you. We were a little worried when the ships tendering did not go as advertised and we were so late in meeting you but it all worked out well. It was a very good overview of the island. Just wish we had more time there and could have stayed at some of the sites a little longer and taken in a few others like the winery and the Red Beach. 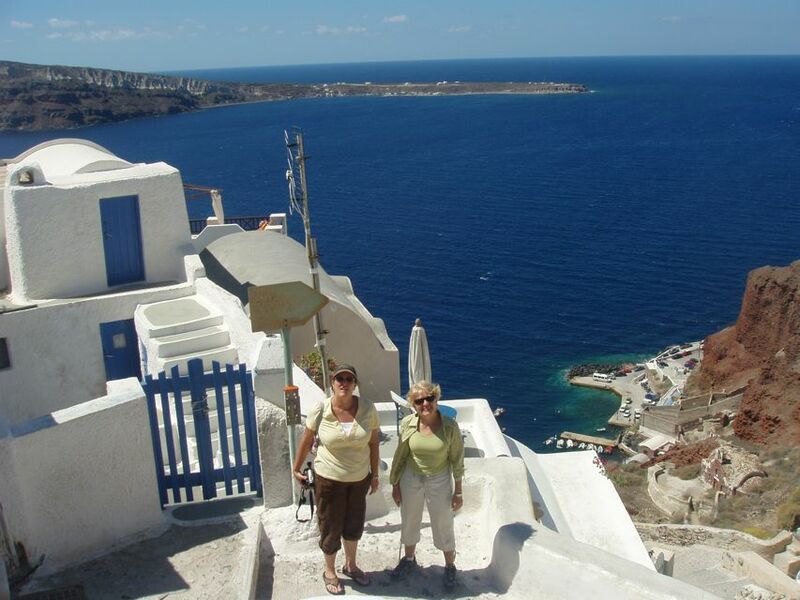 We think we will come back to Santorini to stay a week or so in the future and partake in the hospitality and food and get to see the famous sunsets and do more shopping. Thank you for taking care of us. 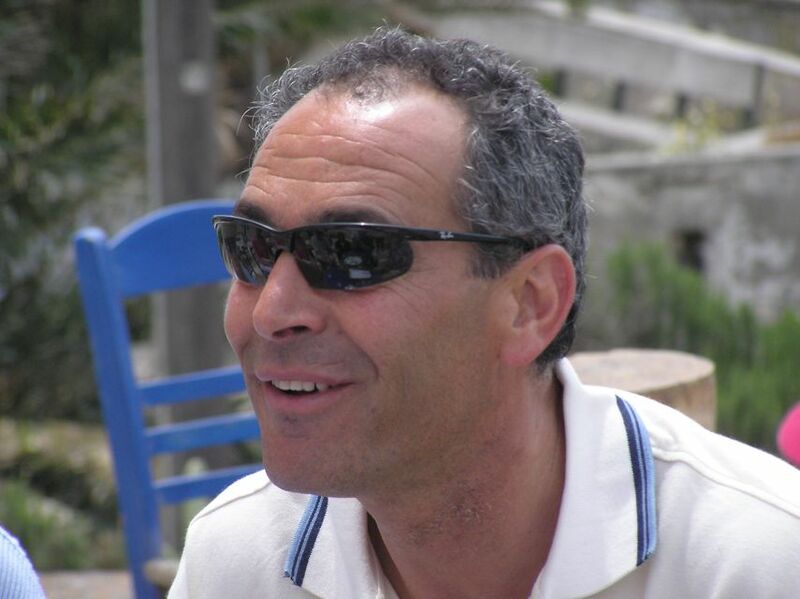 I just wanted to thank you for the recommendations for tours in Santorini, Rhodes and Crete. All three of these people were terrific and made our visit to their islands great. I will be sending them notes they can use for their own advertising as we all agreed they made our days there. We have just returned home from our wonderful trip and I wanted to take some time to thank you. I am sorry we did not have an opportunity to meet you but Gabriel was just wonderful. We so enjoyed spending the day with him. He did a fabulous job and gave us an unforgettable day. He was such fun and knows so much about the island. We could not have been happier. I will highly recommend you to any of my friends that will be visiting your beautiful island. Please give our regards to Gabriel and if you are ever in Tampa please email me so we may show your our city. Thanks so much again. I am so sorry it has taken me this long to thank you for a wonderful tour of your beautiful island of Santorini on May 25! It was truly the highlight of my vacation . . . made possible, of course, by you! Your warmth and enthusiasm are what converts "just a tour" into a "visit with a friend"! We all loved the Raki tasting and the wonderful lunch at Remezzo. You obviously love what you do, which makes for a very special experience for us all. If you ever need references, please feel free to contact us. Congratulations on the upcoming addition to your lovely family. Athena is beautiful and I'll bet she is looking forward to a little brother or sister. If time permits, please let us know when he/she arrives! We want to send our thanks for our wonderful day with you on your beautiful island. Santorini and our tour with you was truly the best day of our cruise, thanks to your good humor, good information and so much fun. We were very happy to meet Jenny, Rob, Jan and Lewis, and we hope to see them again. We did tour the Cote d'Azur with them. Our lunch at Remezzo was delicious, and I'm so glad to have the glass pitcher for a souvenir. If any of our friends plan a trip to Santorini we will surely give them your name and tell them you are the best! Hank and I wish you and your family much happiness with your new baby. It would be a pleasure to meet again some day. 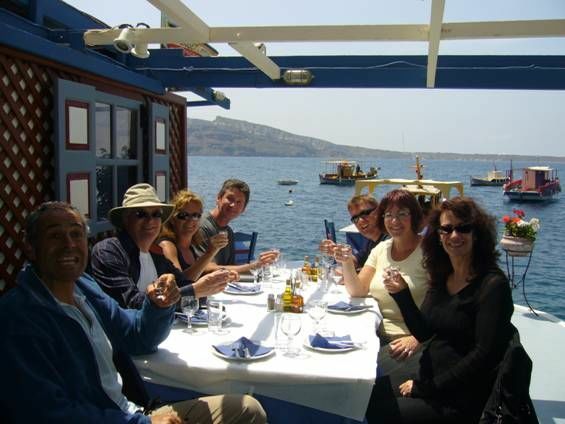 Our group thoroughly enjoyed our tour of Santorini with you. We were a little worried when the ships tendering did not go as advertised and we were so late in meeting you but it all worked out well. It was a very good overview of the island. Just wish we had more time there and could have stayed at some of the sites a little longer and taken in a few others like the winery and ancient Thera. We think we will come back to Santorini to stay a week or so in the future and partake in the hospitality and food and get to see the famous sunsets and do more shopping. Thank you for taking care of us.